14/06/2018 bootcamp, Colaboraciones, Exhibitions, fab lab barcelona, fab textiles, fabricademy, Fashion ShowAldo Sollazzo, anastasia pistofidou, BASF, Bioplastic Wunderpants, BioShades, cecilia raspanti, Clara Davis, Crafting the future, Design Museum, Etopia, fabricademy, fabtextiles, In3dustry, Innovation in Design, Maker Faire Rome 2017, Mazda Space, Museu del Disseny, Noumena, Noumena Inauguration, The future of clean garment, What's Next ? This year Fab Textiles travelled in various spaces and events, continuing to spread, between innovation and sustainability, a new vision for the future industry of textiles and fashion. Anastasia Pistofidu nos habló en #MazdaCreators sobre las posibilidades para paliar el proceso más contaminante de la industria textil: el teñido de fibras. Con ella, cerramos el ciclo de ponencias Human Hardware en el Mazda Space. 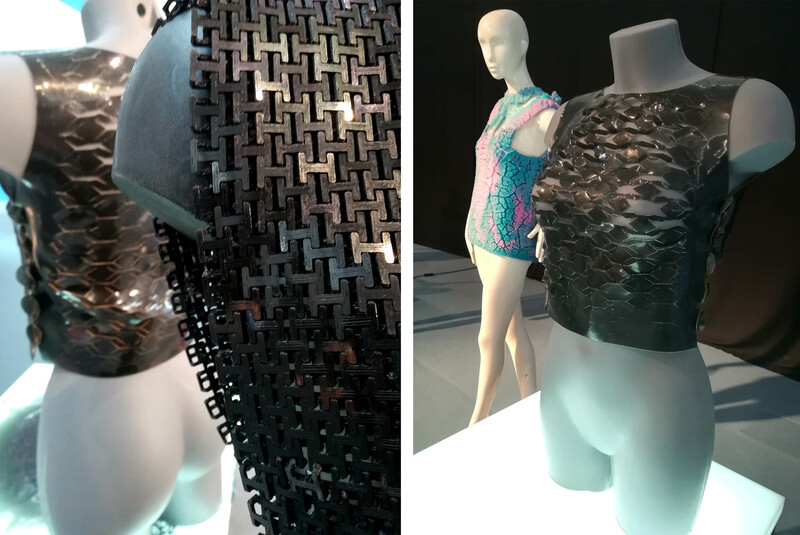 Last October, Fab Textiles was represented at one of the world’s largest 3D printing conferences, the In(3D)ustry, hosted this year at Fira Barcelona and titled “From Needs to Solutions”. Fab Textiles was also part of the jury at the 3rd edition of the Reshape competition, ¨Programmable Skin“. whose theme focussed on new materials and the interactions between garment and body. 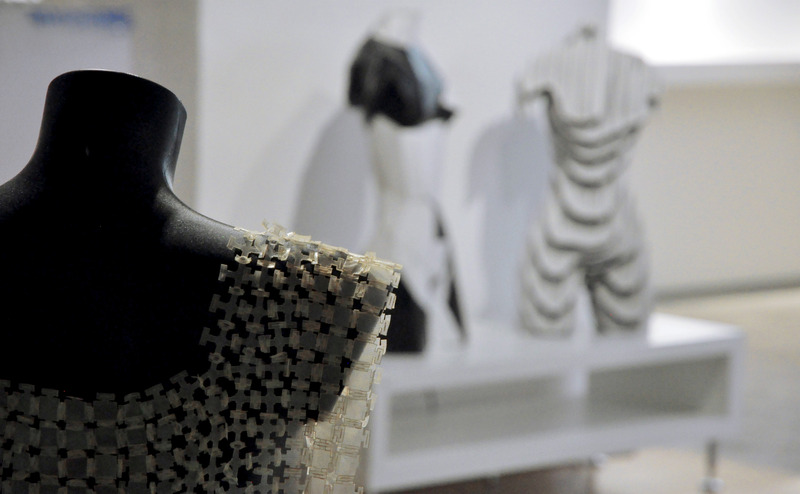 Fab Textiles presented two pieces at its exhibition – a 3d printed top and a biofiltering top. The 3D printed top is a chainmail composed of 3d modules printed in such a way as to create a flexible structure. This assembling system allows you to create a garment adaptable to any body shape. This design is an open source file, create on Rhinoceros software, that you can download online to make your own. The biofiltering top is a garment that cleans the air by absorbing pollutant particles. This experimental top was made out of bioplastic mixed with activated charcoal. 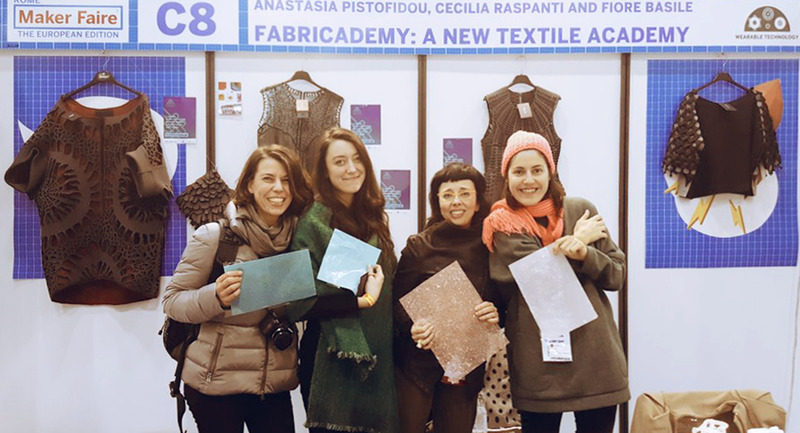 In December, Fab Textiles presented Fabricademy, its new textile and technology academy, at Maker Faire Rome 2017. Anastasia Pistofidou, Cécilia Raspanti and Fiore Basile, Fabricademy founders, gave a talk about evolving education in fashion, wearables and biology with distributed networks. Fabricademy is a transdisciplinary educational program that uses digital fabrication and new technologies to open new perspectives in the fashion industry. One year ago, Mazda Space started a series of events based on Human Hardware, a theme studying the relationship between Human and Technology in several disciplines. After the conference of Neil Harbisson, cyborg-artist, and the demonstration of Burton Nittab, biotech designer, Anastasia Pistofidou closed the cycle with the BioShades workshop and the exhibition Crafting the Future. How can we find alternatives and more sustainable ways to dye our fabrics? BioShades is a project led by Waag Society, supported by the European program of Textile & Clothing Business Labs (TCBL) that connects textile designers, industries and innovative laboratories to study the potential uses of bacteria dyeing in the textile industry and its scaling up to industrialization. The purpose is to create new micro-industries, local and independent, returning us to a closer relationship between producer and consumer by raising awareness and educating. You can read more about the BioShades workshop on this page. Crafting the Future is a collection of sustainable and innovative garments, prototypes and materials made by the FabTextiles team, Fabricademy students and with outside collaborations. 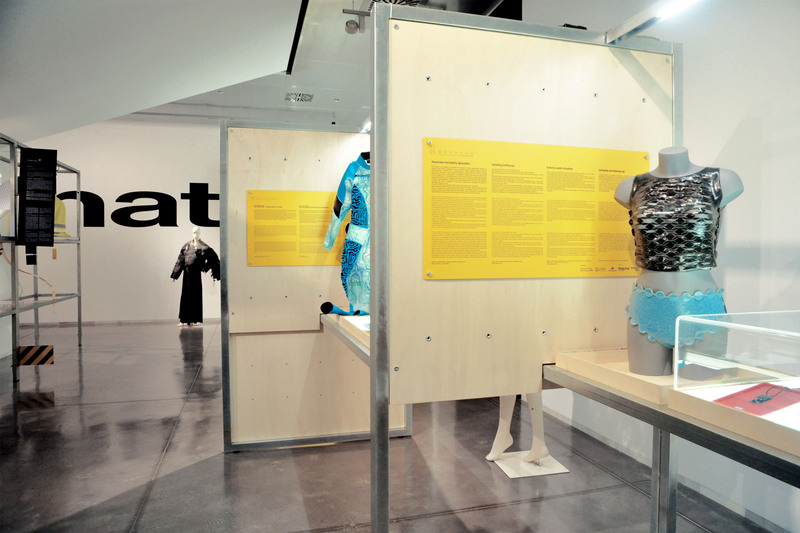 * In this exhibition you can see a rich selection of revolutionary designs like digital body mannequins, modular & seamless garments, bioplastic cloths, 3d printed tops, wearables, an embroidered speaker, crystals experiments, bacteria dyeing, bioplastic swatches, 3d printed tests and natural dyeing and thermochromics samples. At the end of March, Fab Textiles presented at the inauguration of the new space, Noumena. A circular 3d printer machine of 800 mm diameters printing clay, drones, robots, virtual reality, other 3d printers reproducing parametric designs, innovative materials. Noumena, founded in 2011 by Aldo Sollazzo, is a multidisciplinary and international practice, invested in fields such as architecture, robotics and wearable technology, and working with parametric design, data design, digital fabrication, electronics and hardware development. Fab Textiles and Noumena collaborate closely on several projects and Aldo Sollazzo is the global istructor of the Fabricademy program on parametric fashion and computational couture.. This year, Anastasia Pistofidou will be one of the jury of the fourth edition of the Reshape competition, “Sensing materialities”. Thank you so much to all friends, who came yesterday or wrote us, cheering from distance! Lot of thanks to our partners of WASP, Extrudr, and to the ecosystem of creative people we wanted to celebrate: Ángel Muñoz with BounceyBox, Silvia Rocchino and her team, to Anastasia Pistofidou and Clara Davis from FabricademySpecial thanks to our team, working hard every day, believing in our program, bringing talent, passion and professionality. Thanks to our family and beloved ones, never lacking support. Last words for my two partners far away: Efilena and Chirag we missed you guys. This one is for you too! 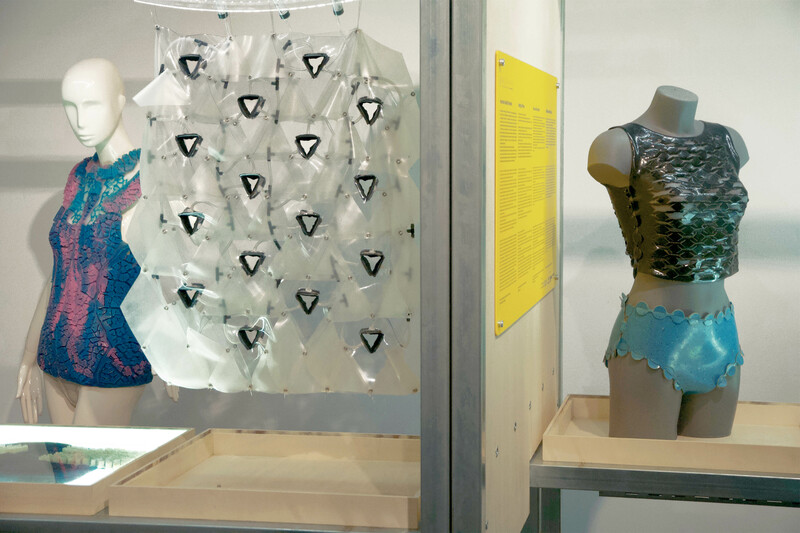 In April, Fab Textiles exhibited Bioplastics Wunderpants in “What’s Next ? 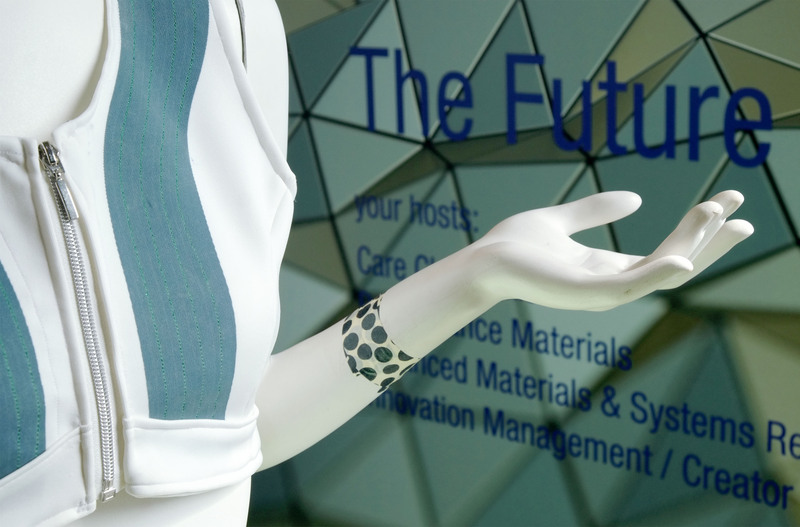 Materials that will shape the future” at the Design Museum of Barcelona. In this exhibition you could see advanced materials made with new manufacturing processes like high performance polymers, nanomaterials, gels, foams, biological materials, light alloys and other types of innovative fibers and fabrics. In April, Fab Textiles also flew to Amsterdam to participate in a 3 days workshop, The Future of Clean Garments, for BASF. During this event Fab Textiles presented a smart micro-factory with two booths : a scanning room and a designing room. Machine automation is slowly replacing manual labour. 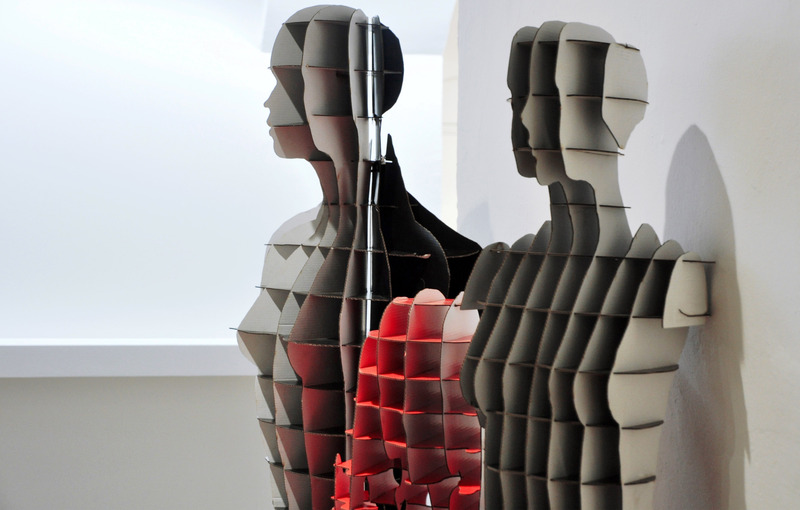 The fashion store of tomorrow will offer designing platforms for personal and mass personalized fabrication. Consumers will be able to desgin their garments through parametric programs and will choose (or even produce their own) the material. The consumer will become prosumer, producing only what he likes, wants and needs. 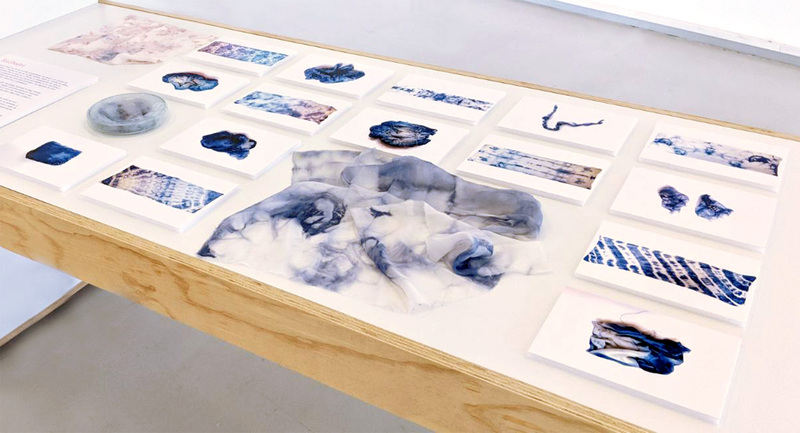 Right after the BASF workshop in Amsterdam, Fab Textiles showcased the bacteria-dying collection, outcome of the BioShades workshop, at the “Innovation in Design” exhibition at Etopia, the Art and Technology Center of Zaragoza. This exhibition, organized by the Superior School of Design of Aragon (ESDA), promoted sustainable and innovative concepts of creation using technology and digital fabrication.The BioShades project presents bacteria as a possible alternative to current polluting dyeing processes. Save the date and come to see us ! the applications of digital technologies in haute couture and wearables, the local designers and the ones from the Fab Lab Network that are researching and creating around the subject. The Fashion Show was celebrating the 4th annual Digital Fashion and Wearables Showcase, and it was organized in collaboration with Protein Lab of UTEM. In Santiago de Chile there were few initiatives of designing digitally for fashion and the integration of electronics on the garments. Fab Textiles, traced the few designers and labs that are promoting this field, Claudio Paredes with Utem Proteinlab and Open Textiles of Fab Lab Santiago. International designers from the Fashion School of Veritas of Costa Rica, Fab Textiles of Barcelona, Fab Lab Kamp-Lintfort, Textile Lab Amsterdam, Aachen University and others were showcased. 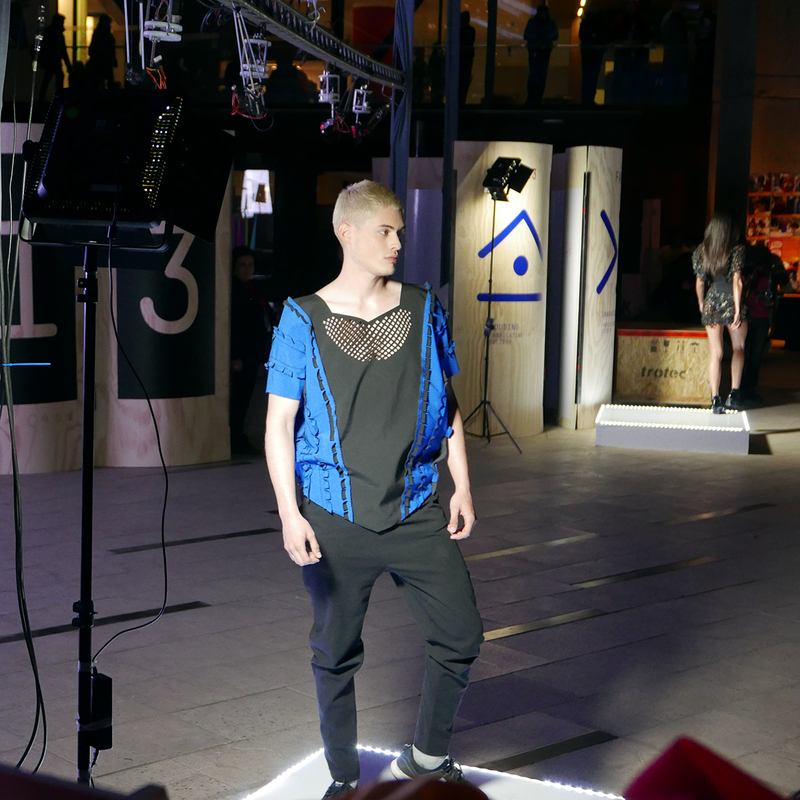 Applications from 3D printed fashion, 3D printing on Fabrics, Haptic Vibrational feedback and light emitting garments were some of the projects one could see at the Show. 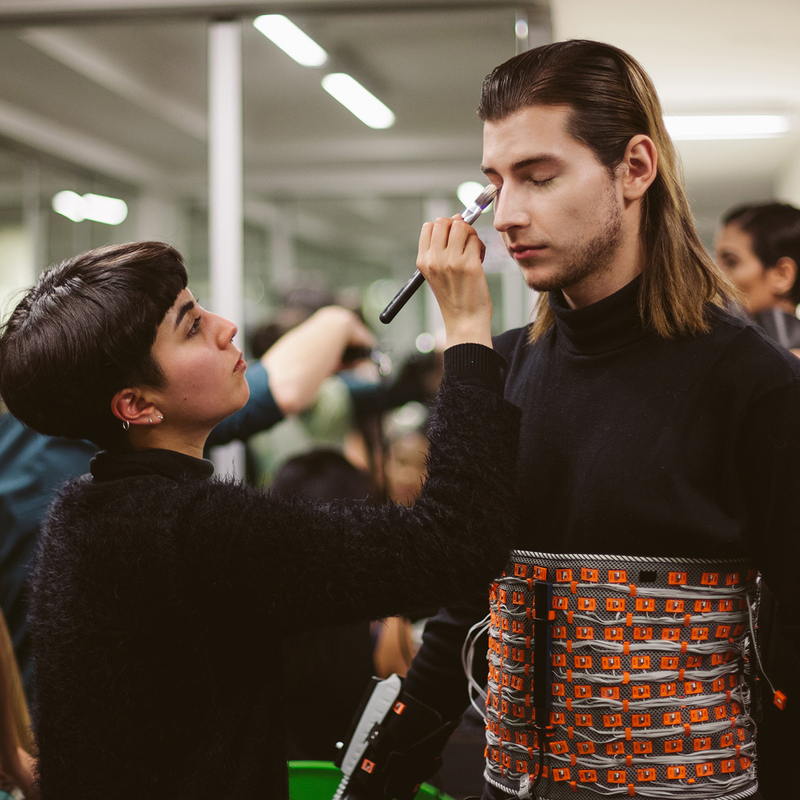 Probably this was the first initiative in Chile, open to a wide public that for the first time was exposed to a different imaginary for the prominent future of fashion technology.